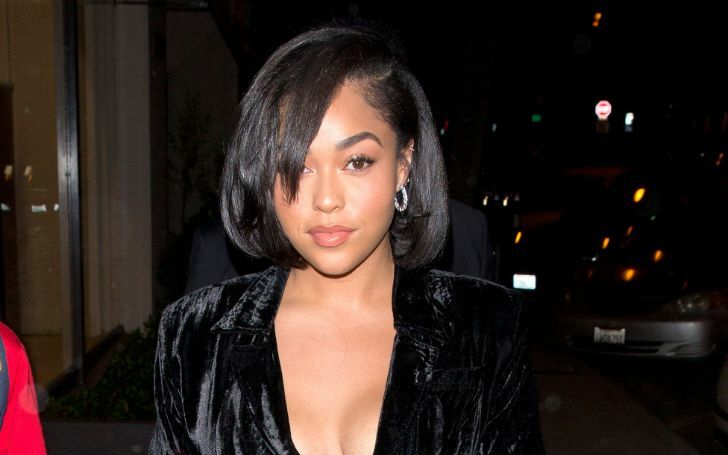 Jordyn Woods is back on business following her involvement in Tristan Thompson cheating scandal. Time sure does fly quickly! It only feels like yesterday we reported on the whole cheating scandal that occurred between Jordyn Woods and her best friend' sister Khloe Kardashian's now former boyfriend Tristan Thompson. Unbelievably, it's been nearly a month. And as a matter of fact, everything is going back to normal again. After all, Life does go on. As Khloe focuses on the upbringing of her eleven months old daughter, True Thompson, whilst Tristan focuses on his basketball career, Miss Woods appears to have moved on from the whole situation too. The 21 years old is indeed back on the track. Jordyn Woods announces her lash collection with Eylure opening in London. Since her short Instagram hiatus following the scandal, the part-time model who's back on the platform made an announcement of the news on her upcoming work trip to London next week. Sharing the news to her nine million followers on the photo-sharing app, Woods revealed she will be promoting her cosmetic collaboration with Eylure, Eylure X Jordyn Woods Lashes. For the particular post, Woods shared a sun-kissed image taken inside a room where she can be seen wearing a black plunging featured dress whilst she poses with her hand hovering over her head as she slightly leans on the door. "I am so excited to come to London next week to celebrate my @eylureofficial lash collection launching exclusively in @superdrug ❤️ All three lashes will be available in stores on the 25th of March!" The news comes shortly after her recent appearance on Jada Pinkett Smith‘s Facebook Watch show; Red Table Talk, where she opened up about her side of the story that went down between her and the 27 years old NBA star. "No passion, no nothing, on the way out. He just kissed me. Like a kiss on the lips, no tongue kiss, no making out, nothing." "I am no home wrecker. I would never try to hurt someone’s home, especially someone that I love. And someone that I’ve seen — has a beautiful daughter. I never was trying to steal someone’s man." However, after receiving backlashes from the internet claiming Khloe was acting rather stupid for blaming the whole thing on Jordyn, Kardashian then made a series of emotional tweets blaming Thompson this time. "This has been an awful week & I know everyone is sick of hearing about it all (as am I). I’m a rollercoaster of emotions & have said things I shouldn’t have. Honestly, Tristan cheating on me & humiliating me, wasn’t such a shock as the first time." "What’s been harder & more painful is being hurt by someone so close to me. Someone whom I love & treat like a little sister. But Jordyn is not to be blamed for the breakup of my family. This was Tristan’s fault." Meanwhile, Woods' friendship with now-estranged Kylie Jenner still appears to be in mess. Sources report the two once what used to be inseparable now are found to be nowhere near in contact with each other. As a matter of fact, Kylie is still yet to publicly speak on the matter.